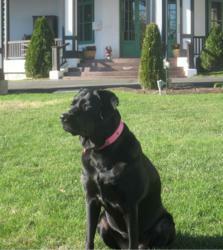 New Brunswick holidays made extra special at the St. Andrews Algonquin Hotel with greetings from Piper the black lab. She is available to accompany guests for a stroll around the charming town of St. Andrews by-the-Sea or for a game of fetch on the front lawn. Piper also enjoys her duties as hostess for the hotel. The Algonquin Hotel has introduced the newest staff addition to the St. Andrews New Brunswick resort. Piper, a black lab originally trained as a guide dog by the Canadian Guide Dogs for the Blind, has come out of retirement to become the Algonquin’s Canine Ambassador. In her role as Canine Ambassador, Piper welcomes guests in the lobby with a wag of her tail, making them feel right at home. She is available to accompany guests for a stroll around the charming town of St. Andrews by-the-Sea or for a game of fetch on the front lawn. Piper also enjoys her duties as hostess for the hotel. With a number of holidays just around the corner, Piper’s schedule is a busy one, hosting the Easter Sunday Brunch on April 8 and Mother’s Day Brunch on May 13. Brunch patrons at the St. Andrews hotel can have their photos taken with Piper following both brunches, which will boast a decadent selection of hot and cold entrées complemented by breakfast delicacies and sumptuous desserts, bringing out the gourmet in your whole family. The bright, soothing atmosphere of the Passamaquoddy and Shaughnessy rooms will offer an elegant and enjoyable surrounding for these family feasts. The Algonquin Hotel and New Brunswick resort is looking forward to Piper hosting a mid-April (weather permitting) season opening of the breathtaking oceanfront 18 hole, 72 par golf course. The Algonquin New Brunswick Golf Course is usually the first one to open and has been open as early as April 2 in past years. Open year-round, the historic seaside resort combines old world charm with modern luxury. Located in the welcoming town of St. Andrew’s-by-the-Sea, the New Brunswick resort features spacious manicured grounds, a full service spa, 4 restaurants, traditional afternoon tea and monthly themed brunches. The Algonquin Hotel is ideal for hosting a Maritime meeting with over 19,000 sq. ft. of versatile New Brunswick conference facilities. To book one of the many Canada vacation packages at the New Brunswick resort, visit http://www.algonquinresort.ca. A Maritime tradition in its second century of impeccable service, The Algonquin Hotel is open year round and features 234 rooms. The heritage property is located in the New Brunswick resort Town of St. Andrews by the Sea which is situated on a peninsula overlooking the world-renowned Bay of Fundy featuring multitudes of spectacular Maritime activities and adventures. The Algonquin Hotel offers many on property resort experiences including four Food & Beverage outlets, Banquet Facilities which are ideal for a maritime meeting or New Brunswick conference. Guests can also indulge in the Algonquin Hotel’s Health Club, Outdoor Pool and the world-renowned signature 18-hole golf course which was designed by Thomas McBroom. A favourite New Brunswick golf course, The Algonquin features two of the top ten golf holes in Canada. The St. Andrew’s resort also invites guests to The Spa to indulge in an oasis of relaxation and tranquility or enjoy a walk around the seaside town with our Canine Ambassador, Piper. For more information, visit http://www.algonquinresort.ca.